Lost Journey is a brilliant 2D platformer, which has been available for Amdroid devices, for a long time. The game has some really beautiful graphics, which are hand drawn. The unique thing about the game, is its gameplay. The environment in the game can be changed, when the phone's orientation is changed from landscape to a 180°C, angle. You can repeat it to go back to the other dimension. This is the way you solve puzzles, get over obstacles, and progress through the levels. Speaking of which, the levels are spread across 4 worlds in the game. There aren’t very many mobile games, which can be called a quality piece of work, let alone inspire you to play all the levels, but lemme tell you that the game devloper, Dream Sky, has made sure Lost Journey is fantastic. 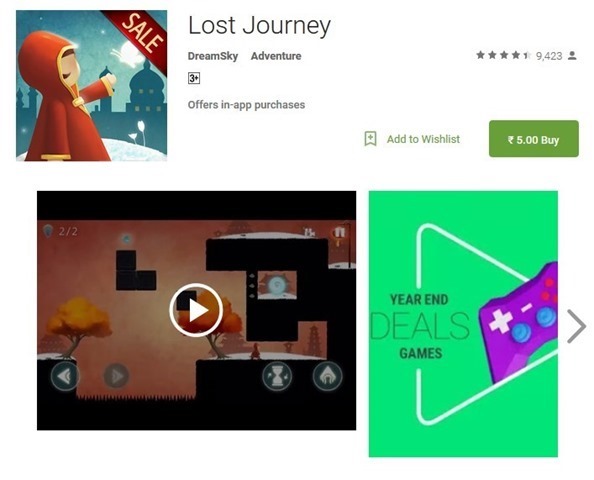 You can buy Lost Journey for just Rs. 5, from the Google Play Store, in India. The game has a few In App Purchases, which can be avoided as they are completely optional. We are not sure how long this sale will last, but the description does mention the words Google Play Year End Sale. That's just a couple of days away.